Who doesn't love fun chocolate facts? Chocolate is the world's most popular candy, and people all over the globe enjoy this tasty treat on a daily basis (and probably more than once!). Why not learn as much as you can about this "food of the gods?" How about a history lesson - where did chocolate come from? Originally native to North and South America, the Aztec people were the first to harvest cocoa beans and turn them into something edible. They also used chocolate as a major form of currency, since it was such a valuable asset in their civilization. The Aztecs enjoyed an unsweetened chocolate drink called xocoatl, which when pronounced in their native tongue of Nahuatl sounds a lot like the English word "chocolate." Xocoatl was believed to be a very healthy drinks that fortified the body, nourished the soul and increased both intellectual and sexual potency. The Aztec people did now have any sugar at that point in time, so they seasoned their drink with chilis and corn meal. These days, you might see Mexican hot chocolate mixes that have a little bit of spicy cayenne pepper in them - this is a throwback to the Aztec drink xocoatl. 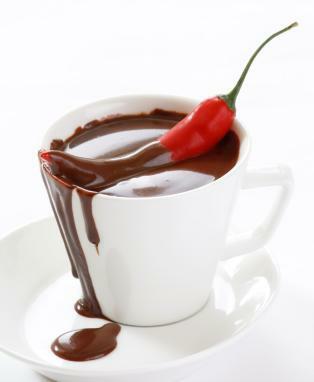 You can also make Mexican hot chocolate at home (it also makes a tasty fondue!). After he conquered the "New World," Cortes returned to Spain in 1528 and brought back with him the Aztec cacao beans that he'd discovered. Since chocolate was expensive and reported to have very powerful properties, it was reserved for only the wealthy class of Europeans. It soon spread though the upper class kitchens of France and Great Britain, where it was enjoyed by royalty. Want to know about chocolate? Want to know more about chocolate? These fun chocolate facts are fun to share with your friends, especially over dessert or a warm cup of hot chocolate! In its natural form, chocolate is very bitter - in fact, the Aztec word xocoatl actually means bitter water. To make it palatable, cacao needs to be processed in many different steps that includes fermenting, roasting and grinding the beans before mixing with sugar and other tasty ingredients. Did you know that chocolate has caffeine in it? There are many arguments about exactly how much, but if you're not used to the effects of caffeine, a chocolate bar might increase your energy levels for a bit. Imagine how the Aztecs felt when they drank their xocoatl! The Swiss people eat more chocolate than any other country. Did you know that a small amount of dark chocolate can actually improve the health of your heart? Studies have shown that 1 ounce of dark chocolate a day statistically reduces your chances of developing cardiovascular disease by lowering blood pressure and preventing blockages. This does not go for milk chocolate though, where high amounts of sugar appear to negate the chocolate's positive effects, and eating an entire chocolate bar is not exactly good for your health. 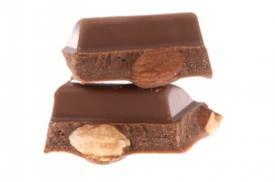 The shelf life of chocolate is about one year, after which it begins to degrade and lose flavor. If you want it to keep longer, keep it in the freezer. And that white stuff that develops on chocolate bars? Unless it's mold, that white powder is a natural part of chocolate's aging process. Some say that Napoleon carried chocolate with him into battle as a quick "pick me up" during long, hard days at war. Back in the days of black and white films, chocolate syrup was often used to represent blood in horror films since it was thick, dark and shiny. One example of this is the famous shower scene from Alfred Hitchcock's "Psycho." Richard Cadbury came up with the first heart full of Valentine's chocolates in 1861. Since then, millions are sold every year for this special holiday.